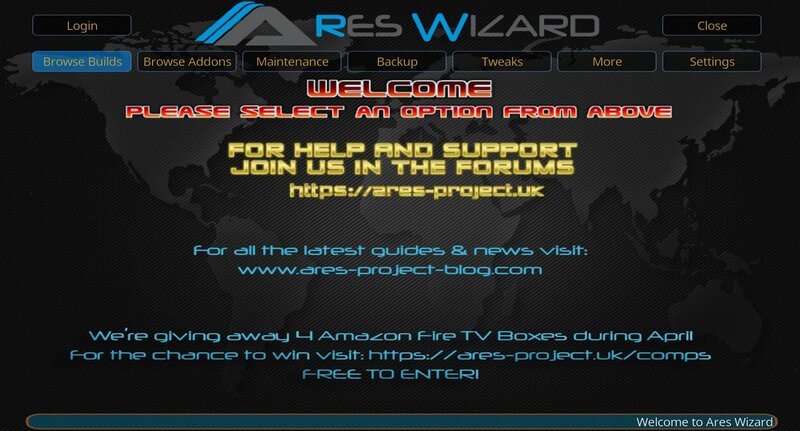 Ares Wizard for Kodi 17.3 is a wizard for Kodi that provides hundreds of different Kodi Builds and Kodi add-ons. It’s by far the most popular and well known wizard for Kodi. It’s gained it’s popularity due to hosting some of the best builds known for Kodi Krypton right now, and it installs them at the push of a button. If a message pops up saying Unknown Sources needs to be enabled, check our short guide here to enable them. Open System (top centre cog icon) > File Manager > Add Source. In the bottom box, input “Ares” and press OK to finish adding the source. Kodi home screen > add-ons > add-on browser (top left icon). Choose install from ZIP File and choose “Ares“. Install the ZIP File in there (repository.aresproject). Give it a few seconds/minutes to install. Open Ares Wizard, found under program add-ons on the home screen. As this build is from the Ares Wizard in Kodi, you will be asked for a pin. When the message pops up, hit the “Get Pin” button. A web browser will open, giving you a 4 digit pin. Go back into Kodi, and press “Enter Pin” in the Ares Wizard. Enter the pin you received to get access to the build. You can scan the QR code or enter the given URL on your mobile too.